Nine songs infatuate the modern equivalent of a power-quartet that gets off to a flying start. Leaping out of the gates are Troy Roberts (on soprano saxophone for starters), Silvano Monasterios on piano, Jeff “Tain” Watts on drums together with his old doppelgänger on bass, Robert Hurst. The visceral energy from this group is palpable as Troy Roberts puts his fellow musicians through their paces. In their hands these musicians essay forth with fastidiously-controlled moods and tonal colors. In these hands is also musical revelation. The tempo of each song is cool or hot, and deliberate, the passagework vivid and playful; that playfulness segues into profundity as the music transitions into Rivera Mountain where every bar of the music is infused with visionary authority as a soft hail of gem-like notes rush, gleam, resonate and bounce out of the horn of Troy Roberts, a young saxophonist who, as it turns out is now being hailed as Australia’s gift to the art of Jazz saxophone. 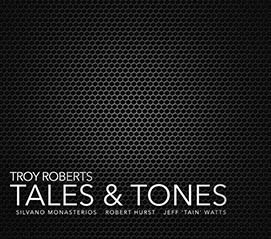 Tales & Tones focuses on the narrative aspect of Roberts’ playing while also highlights his facility with the tonal palette of his choice of woodwind instruments. The soundscape of this recording features a rush of boisterous Jazz pieces laced together with elegiac reflections such as Rivera Mountain. In the soundscape drenched with polyrhythms created by the emphatic sleight-of-hand of “Tain” Watts’ drums and low growl of Hurst’s bass, Roberts is kept on his toes throughout. To his enormous credit, the young saxophonist is every bit as responsive to the rhythmic prodding of the drummer and the bassist. The pianist Monasterios, for his part keeps up with both the breakneck as well as the laid-back balladry with even-handed rhythms that are crisp and buoyant even as virtuoso passagework is dashed off with devil-may-care abandon. This is truly impressive playing by every member of the quartet and one of the best places to enjoy this is on Billy Strayhorn’s Take The A Train with its wonderfully swing changes in tempo. Fleeting moments in the more introvert pieces such as Bernie’s Tune and Pickapoppy feature expressive gestures (dynamic swells, romantic ritardandos and elaborate cadential flourishes by Roberts. This kind of musical treatment is diametrically opposite to what happens elsewhere, where the music is forcefully pummeled – especially by “Tain” – as in the show-opener, Decoration. However, here too, even “Tain” and Hurst are careful to avoid overkill. On Rivera Mountain, for instance, the drummer is at his most eloquent as the mood is more introspective and his big, bold hammer-throws are replaced by stirring the pea-soup with muted, delicate brushwork which, in turn, paints the melody with an undercoat of soft, glowing colors. Hurst is no less genteel, even when his bass sings with characteristic gravitas. Not to be outdone, Monasterios chips in with his own subtly varied pastel hues delivered with delicacy and at an unusually gentle pace. There is so much remarkable talent and attention to detail in the individual playing on this recording, all of which slides into an ensemble venture that is gilded and interlocked with silken threads that’s hard to find on so many quartet albums today.